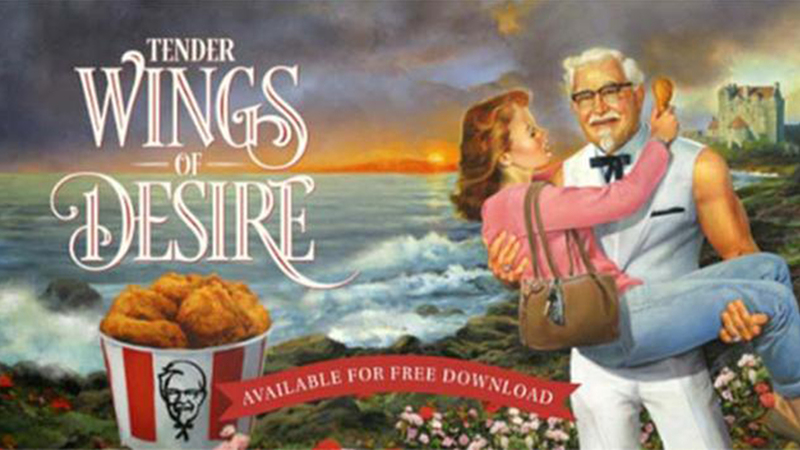 In honor of Mother's Day, KFC has released a romance novel starring Colonel Sanders. "Tender Wings of Desire," tells the story of Lady Madeline Parker who falls in love with Harland Sanders, "a handsome sailor with a mysterious past." The company made the announcement on their Twitter page Thursday. The post read: "Give Mom her true heart's desire this Mother's Day, a family meal and a romance novel featuring Colonel Sanders." The company said sales spike around Mother's Day, so they wanted to do a little something extra for moms on their special day. The Charlotte Observer reports customers buy 50 percent more KFC on Mother's Day. Adding that Mother's Day sales this year are expected to be 1.5 million pounds or 6.5 million pieces of chicken, 815,000 servings of mashed potatoes and gravy, and 470,000 servings of coleslaw. This steamy, love story is roughly 96 pages long and is available to download free from Amazon. But be warned, the book is pretty fowl. So far, the novel is getting rave reviews on the site. One reviewer wrote: "Reading this novella is akin to eating a bucket of the Colonel's chicken - the sensation is overwhelming, and yet you still want more. I eagerly await the sequel novella, '50 Shades of Gravy.'" However, not everyone is impressed. "It took Colonel Sanders 45 pages to show up! When he did, he didn't even have a bucket of chicken! The passion was basically just a bunch of make out sessions. There was no talk of her touching his warm inviting drumstick. I was let down," one customer wrote. KFC has been coming up with creative ways to promote new meals and sandwiches, including hiring Rob Lowe to play Mission Commander Colonel Sanders and announce its new Zinger sandwich.